One last teacher thank you card. My 14 yo son didn’t want anything too frilly or teacher-ish this year so I went with a bolder approach. This was inspired by The most recent FUSION challenge. The sketch really threw me at first! Only one small shape in the corner? Well, I’m not too much of a CAS gal so I had to expand and embellish that one small shape! I ended up going with some embellies that came with the paper. I was actually lucky enough to win this paper along with some 12×12 paper and two packs of embellies! The tag and clip were in one pack and the other was all die cuts including the butterfly and small banner. I took the reinforcement sticker off, covered the tag in music paper and reapplied the sticker. 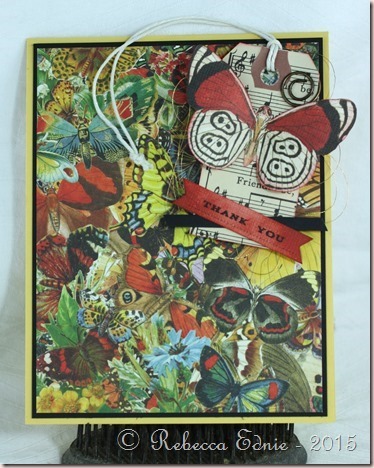 Then I layered on the butterfly die cut and the messy gold thread. Last I inked the banner (it was tan), stamped the sentiment and added it to the tag along with the tiny strip of black cardstock. 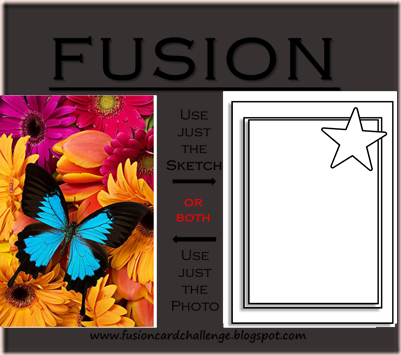 I’m also entering this in the SSS Wednesday Anything Goes challenge.